There was quite a crowd on the banks of the Basingstoke Canal. A dragonfly enthusiast friend had been so incensed by a piece in a local paper that the Canal was a health hazard and an eyesore that he had announced that at a given time, he would pull himself a pint of canal water, and drink it. The paper had said that there were cases of dogs that had fallen into the canal and died, because it was so polluted. Far from dying, my friend simply quenched his thirst, and as far as I know lived on for many years after this experience. 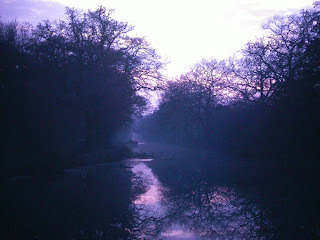 It was in 1970 that I first became aware of the Basingstoke Canal. I had just taken up the post of Keeper of Biology in the Hampshire County Museum Service, and one of my projects was to organise a natural history gallery for the Willis Museum in Basingstoke. I wanted to feature a wetland site, and the Basingstoke Canal seemed promising. I first gained access to it at Odiham, and it took me several hours, armed with a machete to make any progress at all along the towpath. 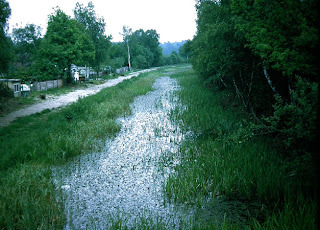 The main channel was almost dry, totally choked with Glyceria maxima, Reed Sweet-grass, so much so that there was little hope of much interesting natural history for my gallery project. Over the weeks, I explored the whole of the Canal, and the section that survives east of the Greywell Tunnel proved to be a gem of a wetland site. 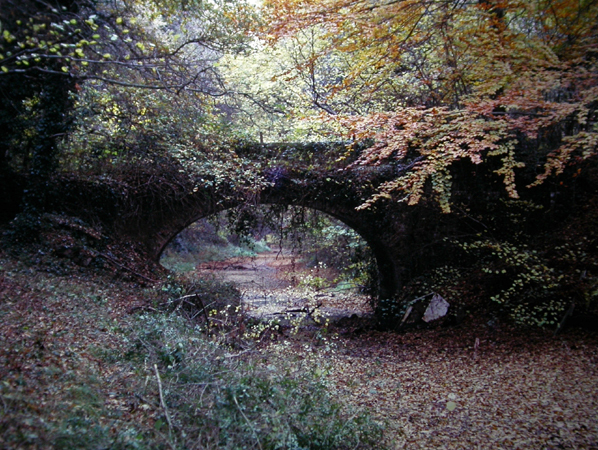 West of the Greywell Tunnel, the western end of which has collapsed there is little water. Sections have been filled in and built on. Quite a length now lies beneath the M3 motorway. It is an exercise in archaeology and map reading to find the line of the Canal in Basingstoke itself where the wharf now lies beneath the bus station. For anyone wishing to study the fauna and flora of an inland waterway, the Basingstoke Canal offered so much. In a short stretch close to Farnborough Aerodrome, the majority of the British dragonfly fauna could be found including the only site known then for the beautiful, and incredibly rare Somatochlora metallica, the Brilliant Emerald Dragonfly. Luckily this species has increased its range considerably in southeastern England since 1970. In the eastern Hampshire section, the range of aquatic plants was considerable and included many rare Potamogeton species (Pondweeds) as well as Hydrochaeris morsus ranae, Frogbit and Stratiotes aloides, the Water Soldier. The perfection of the zonation from a rich bank flora through to floating and submerged species was unique in my experience. When constructed in the eighteenth century, there would have been examples of this ecology in many backwaters and sections of the River Thames and its tributaries. In those days, it was possible for the flora and fauna to invade the newly constructed canal from Weybridge, and to develop relatively undisturbed. Horse drawn barges moved slowly from the Thames to Basingstoke, so commerce and wildlife could co-exist in relative harmony. The collapse of the Greywell Tunnel more than anything else caused the demise of the Canal as a commercial waterway, and since the war, the canal had been allowed to become totally derelict. There are many examples of dried up canals throughout Britain, and this if left, was the future for the Basingstoke Canal. 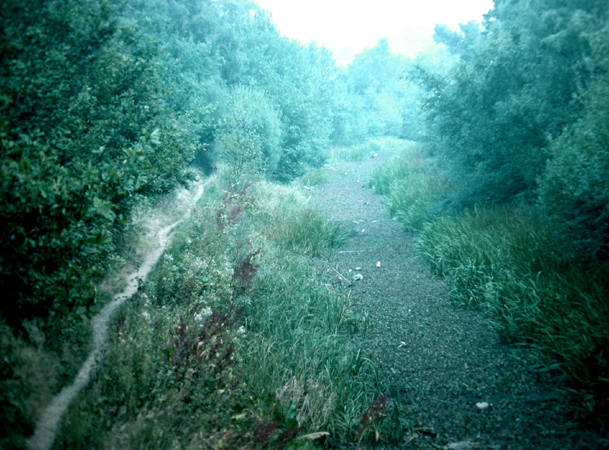 In 1970, much of it west of the tunnel, even where not filled in and built over, was a totally dry ditch, often dominated by nettles or dense scrub. 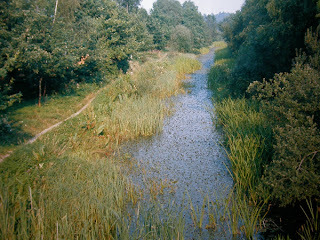 The water supply to the Canal was already compromised through neglect, and without it, it would inevitably dry out soon. Junction with Wey Navigation photographed at dusk, 1974. What a very peaceful scene! Britain has many hundreds of miles of restored canals open to fast, plastic pleasure boats and managed for coarse fishermen. These canals are so intensively managed for pleasure, that wildlife does not stand a chance. It was in the mid seventies that the Basingstoke Canal Society put forward a series of possibilities for the canal’s future. One was to restore it for use by traditional narrow boats only, and to create a canal that reflected the history of commercial waterways in Britain’s past. As plans for its future progressed, so towpaths became more open, and a walk along the canal became a pleasure. Partially derelict bridges festooned in ivy in the middle of wooded sections became an artist’s and photographer’s dream let alone a quiet and peaceful pathway for walkers. Planning meetings were held with the Canal Society to discuss the future of the canal. 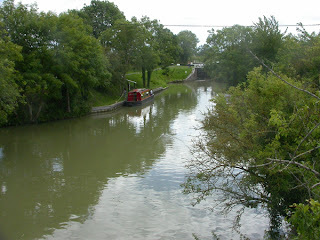 Gradually, it became apparent that the Canal Society’s ultimate goal was to restore the waterway as fully as possible as a resource for all types of river craft. It was strongly put forward that the canal should be fully opened through to Basingstoke. This would have involved the removal of many housing estates in the village of Basing, not to mention the M3 and the bus terminal in Basingstoke. Little support for the importance of the natural history was forthcoming. The then Nature Conservancy had little time for the preservation of man made sites, The fact that the site of special scientific interest was an arbitrary section in the middle of the Hampshire part, which was actually the least important stretch underlined this lack of interest. The Society went through the motions of protecting the wildlife. 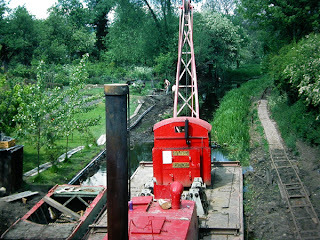 A traditional dredger was used to clean up an initial section to the east of Odiham. A railway was constructed along the towpath to take away the spoil. After a considerable period, the progress made in dredging the canal was minimal, but the mess created considerable. By and by, a more ruthless restoration was put in place with no regard for the wildlife. Some years later, I stood on a bridge in Aldershot looking over a cleared section of the canal. I was standing beside a member of the Canal Society, and mentioned how glad I was that at least some vegetation had survived. “Oh we’ll soon deal with that,” I was told, “We will be using a weed killer on that.” Whether I was being teased, I do not know. The Hampshire section was difficult enough to restore, however the Surrey section contained many flights of locks, and these had to be restored, and this restoration was expensive. The original idea of a museum to British waterways, and the creation of something unique did not fit with its commercial potential. The result is a waterway that is neither one thing, nor the other. The Surrey section supported several rare species such as Leersia oryzoides, Cut Grass, and Potamogeton alpinus, Red Pondweed but these have almost certainly disappeared completely. The unique opportunity to create a waterway reflecting the history of a major mode of transport from the past, along with conserving a rare and decreasing habitat was sadly missed. However, in retrospect, I consider the inspiration and knowledge I received from the Basingstoke Canal to be a very great privilege and I am glad to have been there at the time.